Training for a sport competition is all about achieving one's maximum potential at a specific point in time (the competition), and therefore planning the training regimen based on a specific schedule. However, without a competition in sight, it should still be possible to reach a certain high level of performance (if not peak performance) on a sustained basis. It is not possible to always be at peak performance. We do the same when preparing for a difficult exam. We prepare, we rest the day before to be able to reach peak performance during the exam. How can we maintain a high level of cognitive performance, a high level of learning and adapting throughout life without competitions and exams to push us towards peak performance? We know from neuroscience that one of the key characteristics of the brain is its plasticity. Our brains, just like the rest of our body, have a great deal of potential for remaining highly performant in later years IF we properly manage them. It also relates to Robert Bjork's notion of "desirable difficulty." To maintain a high level of cognitive performance, one hypothesis is that it might be good to create challenges for oneself, the equivalent of the sport competition. A challenge is more than just routine maintenance of the body or the brain. A challenge requires pushing oneself beyond one's comfort zone, doing more than what is achived without much effort. Reading in a different language; watching a movie in a completely different language Watch a documentary on a sport you've never tried; watch competitions from other sports. Picking up a book in a completely different field, something that's going to be difficult to understand, something you will need to pay close attention to cross train, don't stick to one sport that you're comfortable with. Work-based learning can be seen as individual performance and team performance: Individually, we can all work on our performance, but it is when we come together as high-performing teams that the organization really benefits. The same is very true in team sports. Team sports rely on individuals to be fit and performant, but also to train as a team to perform as a team. Teams of individual performers rarely sustain their success over time. On top of the parallels just mentioned in terms of training, we know that a healthy body (achieved through good nutrition, adequate sleep and exercise) is critical for brain health. Abt Associates' Jacob Alex Klerman blogged about the need to proceed with caution when dealing with efforts to measure performance. It can become a very deep and expensive rabbit hole. I'd like to push the idea further from a knowledge management/organizational learning perspective. There have been arguments for including "learning" metrics in individual performance assessments. The (simplified) logic is that if you want to encourage t a particular behavior, you should measure it. I'm not sure if there is research on this topic (I suspect there is), but my intuition tells me that while performance monitoring may be useful to identify and take action on under-performing employees, it is much less useful in rewarding high performance employees who are self-motivated in the first place. You might force under-performing employees to comply with certain things by threatening them with bad performance assessments, but can you force an under-performing employee to learn more? I doubt it. Can you help a willing learner? Yes, but adding a learning metric to their individual performance evaluation won't do it. So, here's the question: How would/could a learning metric have a positive impact on employee learning? 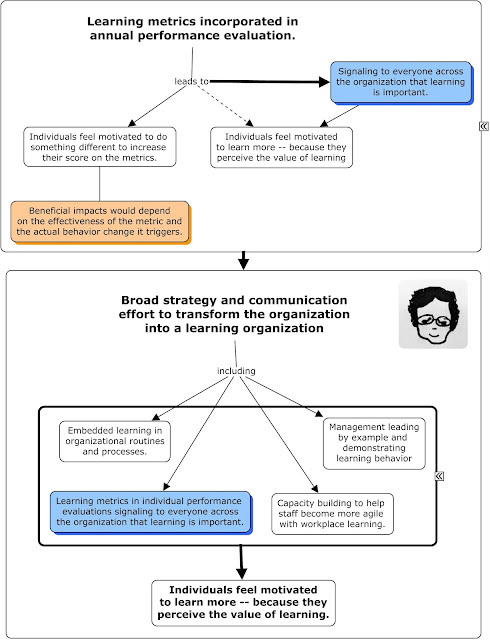 Perhaps indirectly, by communicating the organization's recognition of learning as an important element of performance; by forcing conversations about what constitutes workplace learning, what is an effective learning strategy for individuals. If the ultimate objective is to have these ongoing conversations about workplace learning and how it contributes to individual, team and organizational performance, then individual performance metrics may not be the most appropriate starting point. They may be a minor component of a much broader strategy (see map below). This also illustrates a point made by Beer, Finnstrom and Schrader (2016) in "The Great Traing Robbery," which is that training -- and leadership development in particular -- needs to be fully integrated with organizational development. Nick Milton's blog post earlier this week revisited the knowledge pyramid to suggest a variation (Revised Knowledge Pyramid (1) below) and I am going to suggest here a further variation (Revised KNowledge Pyramid (2)).. I don't think the original pyramid and this last version are meant to convey the same thing, so one is not better than the other. From my perspective, the original pyramid is a little too abstract and usually comes into the picture when trying to explain what knowledge management is, and in the context of inevitably trying to define knowledge (a lost cause in my opinion). To transform experience into something useful, learning must occur. Most learning occurs through reflection, analyzing the experience in light of prior knowledge; But knowledge isn't enough. You still have to do something with it. That's where decision making comes in. Decision making helps transform knowledge into action. Therefore, when we talk about lessons learned, we should be talking about the entire pyramid, from the original experience to the action (what are you doing differently now based on what you've learned?). I'm not completely satisfied with this pyramid though because experience doesn't seem to be the only way we learn. What we learn in school, what we learn from reading a book... those are not things we learn from experience, yet experience and prior knowledge are key in making sense of it all. When I access data and information, I can only make sense of it and transform it into usable knowledge if I have the required prior knowledge and/or experience. Experience-based information and externally-acquired data/information can both be the source of new knowledge. When we train people, we are giving them new information and trying to present it in such a way that it will allow the trainees to make sense of it by connecting it to prior knowledge and experience. When training events start referring to "experiential learning", they are pointing to the fact that learning is more effective when the learners are experiencing a situation themselves and learning how to react to it. Clark Quinn blogged about "Experimentation and Reflection" earlier this week in the Modern Workplace Learning Magazine. It's a recurring theme in my own reflections about Knowledge Management and Organizational Learning. I like reading and interacting with people who work on similar issues yet from a slightly different perspective. While most of the knowledge management and organizational learning professionals I know focus on the group or the organization as the relevant unit of analysis, Clark Quinn, Jane Hart and others who work in the arena of workplace learning within the broader umbrella of "learning and development" (L&D) have a much strong emphasis on the individual as the relevant unit of analysis. I want to work at the intersection of KM/OL/ and L&D. I'd like to argue that what's missing is an approach that bridges all three levels: Individual knowledge and learning, team knowledge and learning processes, and organizational knowledge and learning. The foundation for robust knowledge management at the organizational level is a culture of learning. That culture is an aggregation of the behaviors and attitudes of all the individuals who work in that organization. Therefore, it would make sense to suggest that knowledge management at the individual level (i.e, personal knowledge management) is an important foundation for knowledge management at the organizational level. Putting some emphasis on the individual is not about rewarding individual incentives and addressing the "what's in it for me" attitude that we can encounter when pushing for more knowledge sharing. Personal knowledge management, however, can have a significant impact on 1) personal motivation/job satisfaction; 2) engagement with peers/informal mentoring. Quinn's post mentions the difficulty in measuring the informal learning progress that occurs through experimentation and reflection. I don't generally recommend bean counting when it comes to learning but here is an option to consider. 1. Document your informal learning activities (including your experimentation and reflection activities) in some fashion. This is useful whether you want to measure progress or not. 2. Review your informal learning notes (however you have captured them) on a regular basis (weekly, monthly, whatever works for you). Some of it will be observations. some of it will be key insights, perhaps even some action items that you assigned yourself. As you review notes from several months of informal learning activities, new insights will emerge, new actions to follow through with. That's how the experimentation keeps evolving. It's a form of agile learning. If you track the number of miles you run (regardless of speed) for physical fitness purposes, you can track the number of key insights you generate out of your informal learning activities. By itself, the process of tracking them down will generate new insights. It seems to be an important word. I've missed out on using it for so many years and now there's so much impugning going around, it seems only fair I shall make effective use of it. dispute the truth, validity, or honesty of (a statement or motive); call into question. "the father does not impugn her capacity as a good mother" that doesn't sound right, let's reverse, "The mother does not impugn his capacity as a good father". Better. "Are you impugning my judgment?" I am indeed impugning the judgment of a lot of people these days. Translation: "All it takes is a political, economic or religious crisis for women's rights to be questioned. These rights are not permanently acquired. You must stay vigilant throughout your lifetime." Translation: "No one is more arrogant towards women, more aggressive or more contemptuous than a man worried about his manliness."